The future of farming has arrived. 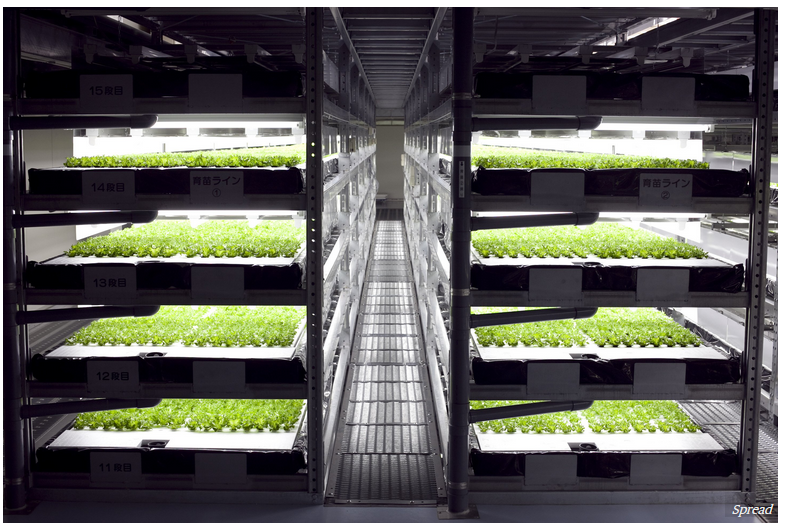 It's vertical, soilless, and run by robots. 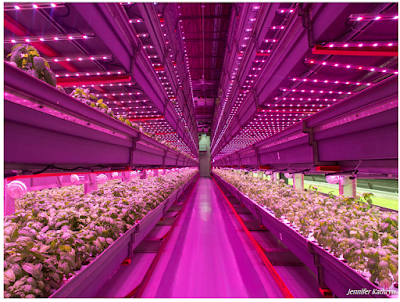 Tech Insider reports World's First Robot-run farm will harvest 30,000 heads of lettuce daily. What starts with lettuce, won't stay with lettuce. Strawberries, cabbage, tomatoes, beans, eggplant, and many other vegetables can be grown this way. Potatoes, peanuts, and things that grow in the ground may be off limits. Corn is too tall with acreage requirements too big. Also consider Indoor Vertical Farm Half the Size of a Wal-Mart. Matt Matros reads about the 34,000 bags of spinach Dole just recalled and shudders. A Salmonella contamination never would have happened on his farm. 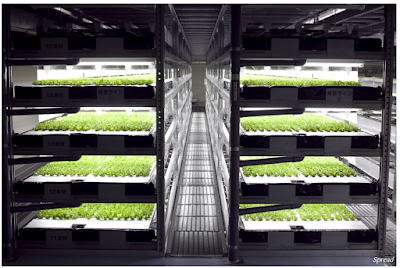 Matros is CEO of FarmedHere, the largest indoor vertical farm in North America. At 90,000 square feet, the Bedford, Illinois farm is a leader in a growing agriculture movement that grows crops without soil and sunlight. Instead, these crops are grown indoors, where they're always monitored and kept away from harmful bacteria. FarmedHere also prioritizes locally sourcing its produce, Matros says. It wants to deliver its herbs and leafy greens to consumers living at most 200 miles away, as part of a larger mission to reduce its carbon footprint. In Matros' eyes, the move follows in the footsteps of the fast-casual chain Chipotle, which recently updated its mission to source from farms at most 350 miles away. With 18 FarmedHere facilities, 75% of the US population would fall within that 200-mile radius, ensuring the produce can reach consumers quickly. So far, the main crops are basil, mint, lettuce, and kale. Those are the low-hanging fruit that are easy to grow, Matros says. Without the hassle of Mother Nature's changing climate, farmers can enjoy year-round growing seasons indoors, using less water, fewer pesticides, and avoid biological invaders that cause diseases like Salmonella, Escherichia coli (E. coli), and Listeria. The company is anticipating an industry-wide tipping point a couple years down the line in which the winners are the local farmers who can provide nutritious food to nearby residents who need it, taking a big chunk of all long-haul trucks filled with produce off the road for good. Instead of digging deeper and deeper wells in the California desert to grow things, water in these farms is 95-98% recycled. And commenting on labor issues, Matros points to Amazon's use of factory robots: "We're going to have that in our next farm, which will be open in about a year." Japan will have similar technology in a similar timeframe. The tipping point for worker-less agriculture has arrived.